The above info came from Tiff and Who Wants to Know?, and was edited by yours truly (contact me). The image came from Endless Vortex. Stepping suddenly into the scene, Duke Devlin originally arrives on a mission: to get revenge on one Yugi Moto for ruining his chances for a great game success. 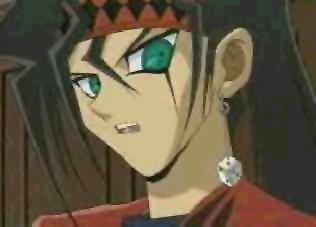 You see, Duke likes Duel Monsters, but his real love is dice. So he decided to develop a way to combine those ideas into a new game. He spent a long time developing every aspect of the game, using concepts from dice-based RPGs and from Duel Monsters. Eventually, he had it all together: Dungeon Dice Monsters. He decided to submit his game idea to Industrial Illusions to see if they would distribute the game. Pegasus himself invited Devlin to Duelist Kingdom to try the game out. Pegasus used the Millennium Eye to cheat and win the game, but he complimented Devlin on such a fascinating concept. He said he'd begin work on the game soon, but he a had a tournament about to begin on the island. He would see to the game after the tournament. Devlin left the island with a marked respect for the man. Yugi then beat Pegasus at the end of the tournament, and ever since then, Pegasus has been out of the picture (Devlin doesn't know the real reason for Pegasus' incapacitation: his encounter with Yami Bakura and the theft of the Millennium Eye). Devlin was mad. To him, Yugi had robbed Devlin of his chance, and he couldn't believe that Yugi could beat Pegasus at the game that Pegasus had created himself. Thus, when he beat Joey and Yugi attempted to challenge to save Joey's face, Devlin set the challenge: a duel with Dungeon Dice Monsters...and if Yugi lost, he'd never duel again. It was then Yugi managed to beat Devlin (at the game that he created) that Devlin realized finally that Yugi was the genuine article: the King of Games. His spirits received a boost, however, when a e-mail came from Industrial Illusions. It was the contract for the Dungeon Dice Monsters game. With that, he was able to make up with Yugi and the gang. 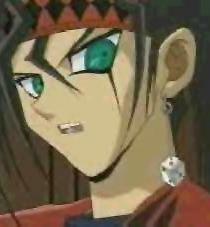 Duke Devlin re-appears on the scene in Battle City, first by coming to Tristan and Serenity's aid. This would turn out, however, to be the beginning of a rivalry...because both he and Tristan are developing a crush on Serenity!